Holi in India- Types and Places to Celebrate Holi "Indian Festival of Colors"
India is indeed a land of diversity and cultural abundance. With thousands of festivals celebrated every year, one that stands out as a universal favorite for all its splendor and celebration is Holi. 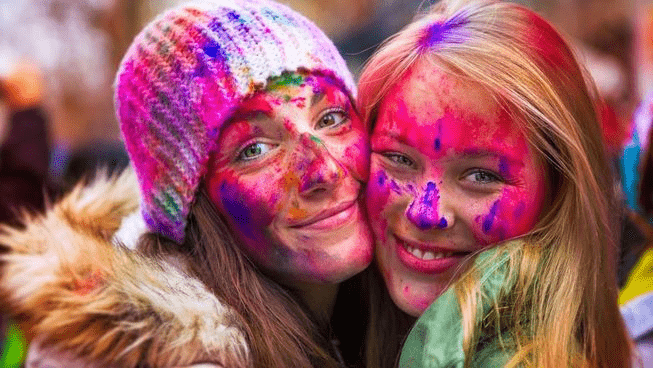 For the uninitiated, we’ve put together all you need to know about what is Holi, best places to celebrate Holi in India, how to celebrate Holi, its history, types of Holi celebrations, dates, and If you are planning a trip to India in 2019 then we have some really important Tips for you to ensure you have a safe and exuberant celebration of Holi in India. 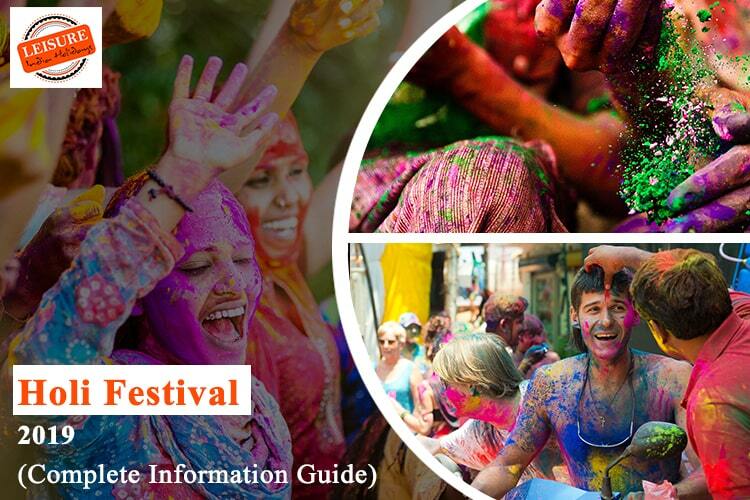 Here’s all the information about the Holi festival of colors in India. Why is Holi Celebrated in India? If you want to know why Holi is celebrated and the history of Holi celebration, let’s give you a little peek into Indian mythology where Holi finds its origins. A festival that spans over two days. 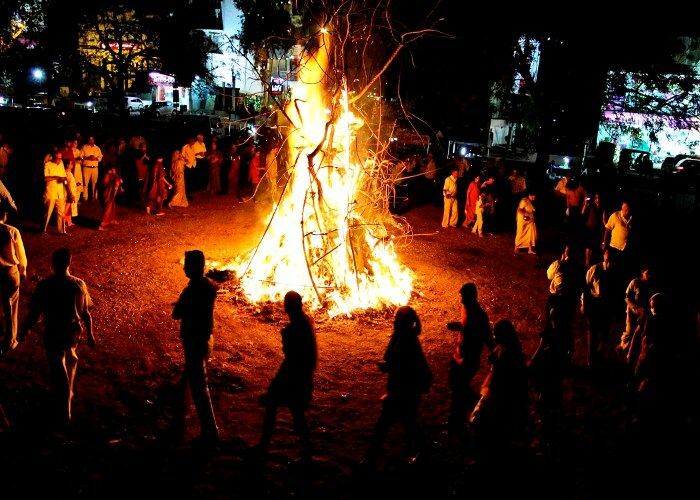 Day one of the Holi festival in India begins with Holika Dahan, with the setting up of holy fire as a symbolic celebration of the burning of demoness Holika by Lord Vishnu. It is believed that Holika tried to kill her brother’s son Prahlad, who was an ardent devotee of Lord Vishnu and was eaten up by the fire she ignited. It is also believed that Holi is a celebration of the divine love of Lord Krishna and Goddess Radha. Lord Krishna, being his naughty self, would color Radha’s face and his with the same color, as a symbol of their oneness and eternal love. Day two of the festival, Rangwali Holi, ushers in celebration, color, festivities, food, and all things fun. 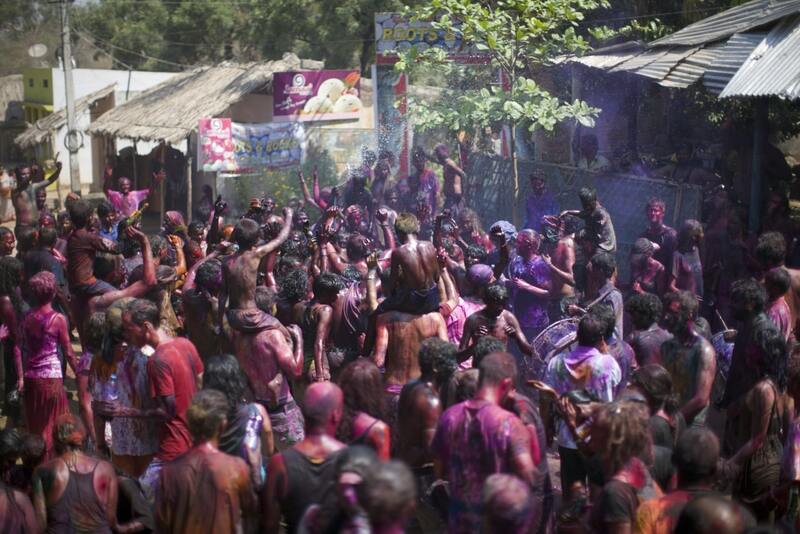 On day two, the community comes together to celebrate this festival by taking to the streets with colored powders (also called Gulaal), water guns and flowers and revel in smearing color on one and all, even the holy deities. 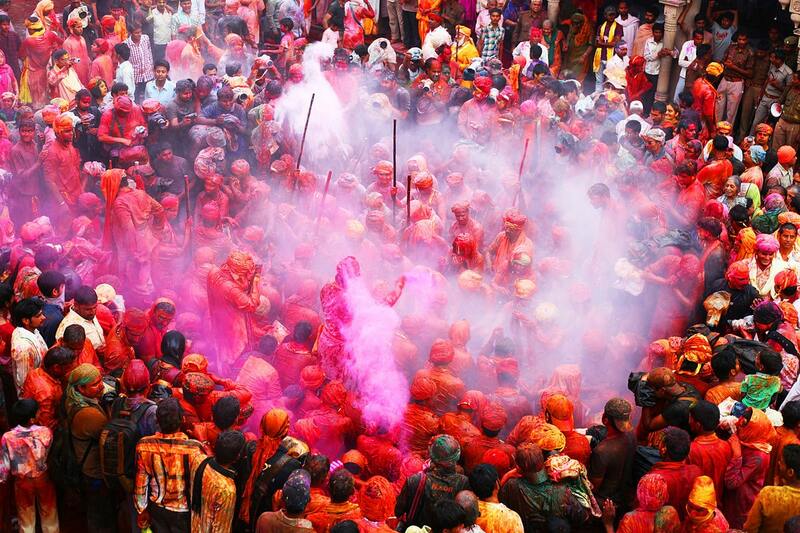 No one is spared of the bursts of color on Rangwali Holi in India. So, beware! For those of you who are wondering when is Holi festival in India in 2019 to plan your itinerary accordingly is, Holi is celebrated with tremendous pomp and fair on the last full moon day in the Hindu lunar calendar month Phagun, which falls in March according to the English one. This year, it falls on the 20th and 21st of March, 2019. While this joyous festival brings different types of Holi celebrations all over India, culturally and religiously rich cities such as Brindavan, Mathura & Pushkar, all of which are 3-5 hours from Delhi, are sure to offer an unprecedented spectacle of celebration. Many tourists head to these cities to experience the festival of colors in all its elements and splendor. Holi is one of the most revered festivals in India, and different types of Holi celebrations is experienced in different parts of India. The state of UP celebrates Holi with the ‘Lathmar’ tradition where women playfully beat men with sticks. Punjab displays martial art capabilities as part of their celebrations while Maharashtra is all about making human pyramids to break suspended milk pots as an ode to Lord Krishna. How Holi is Celebrated indeed differs in different parts of India, but the enthusiasm and revelry remains a constant feature. Celebrating this colorful festival in India is not just a cultural delight but also a culinary one. Special sweets and savories are prepared for this day that includes Malpuas, Mathris, Gujiyas and many other such Indian delicacies that cater to the global palette as well. Don’t miss the Thandai or Bhaang, a refreshingly potent drink that’s made of milk, almonds, spices and a thick paste extracted from the cannabis plant. It is this tonic that sparks all the unabashed revelry on the streets, and you may want to exercise caution in accepting it from a stranger as a measure of safety. But hey, if you’re in good company, your Holi is incomplete without this intoxicating indulgence! Holi celebration in India also holds the significance of the immortal love of Krishna and Radha. People can see this gesture of love and enjoyment in various corners of the states in India. 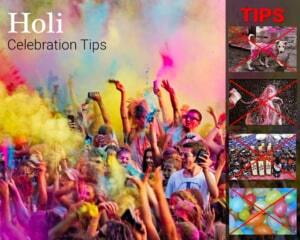 Here, we have a list of the best places to celebrate Holi in India in different styles. Barsana is famous for its “Lathmaar Holi” and the best place to celebrate Holi in India. The story is as interesting as its name. One day, Lord Krishna decides to tease Radha and her friends, but the ladies get offended and furious. So, they decide to teach Krishna a lesson. All the ladies, Radha, and her friends start chasing Krishna with a stick to beat him up. Since then, it is a ritual in Barsana to hit the men with sticks and post that, they all play Holi with dry and wet colors by applying on each other’s face. Originating from Barsana, Lathmaar Holi is the funniest way of celebrating Holi festival in India. So, if you are a man visiting Barsana on the day of Holi, get prepared for some Lathmaar bashing. Isn’t this fun? Mathura is one of the best places to celebrate Holi festival in India and it is also known as the Janma Bhoomi of Lord Krishna which is situated in Uttar Pradesh. To reach Mathura, one can opt for personal vehicles, flights, and public transports. According to Mythology, it is believed that Lord Krishna was born in Mathura. The real experience of Holi should never be missed in Mathura if you are a traveler who wishes to experience the fun and frolic of Holi. The term ‘love is in the air’ can be experienced in every particle during Holi. Children are dressed as Krishna and Radha respectively. People go around the places in trucks, that are decorated with fresh and colorful flowers. They splash the colors in the air and on each other. 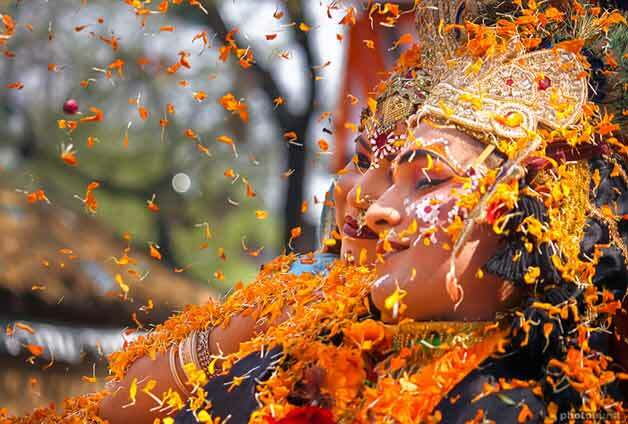 If you are visiting Mathura during Holi, just fasten your seat belts to revel and soak in the colors of love and joy. Vrindavan is famous for “Phoolon Wali Holi” and it is another best place to celebrate Holi festival in India. On the day of Ekadashi, that’s a day before Holi, Banke Bihari temple here celebrates a unique kind of Holi. It is around 10 am, when the temple opens for the regular visiting hour for devotees, instead of using dry or wet colors, Holi here is celebrated by throwing flowers. Hence, the name – Phoolonwali Holi. The priest of the temple throws the basket of flowers over the devotees and chants “Radhey Radhey”. Everyone in the temple repeats the same by chanting and throwing flowers on each other. 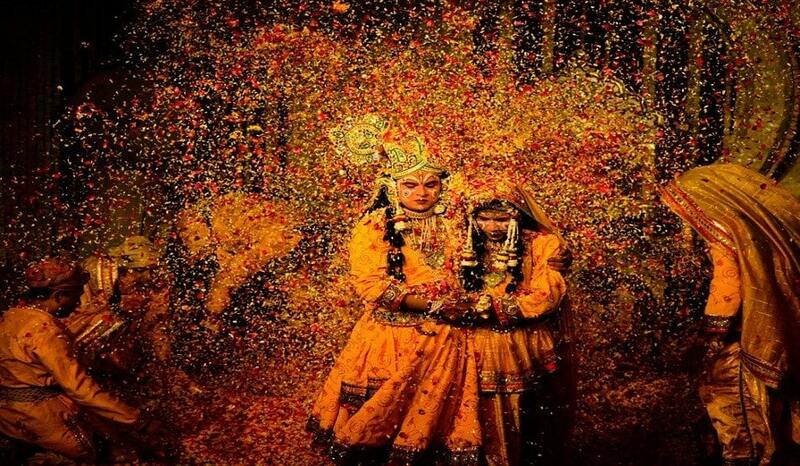 If you are planning to visit Vrindavan during Holi, this is a unique and beautiful experience to be captured in your camera lens. This experience is short-lived, which only lasts for 20 to 25 minutes. How to reach Vrindavan: Vrindavan is a holy town located in Uttar Pradesh, Province of India, famous for its Banke Bihari temple. It is around 9 miles from Mathura. One can reach Vrindavan by Public or Private transport. The royal capital of Rajasthan, when we talk about Jaipur, the pink city, what comes to our mind is the existence of Royal families and their empire. 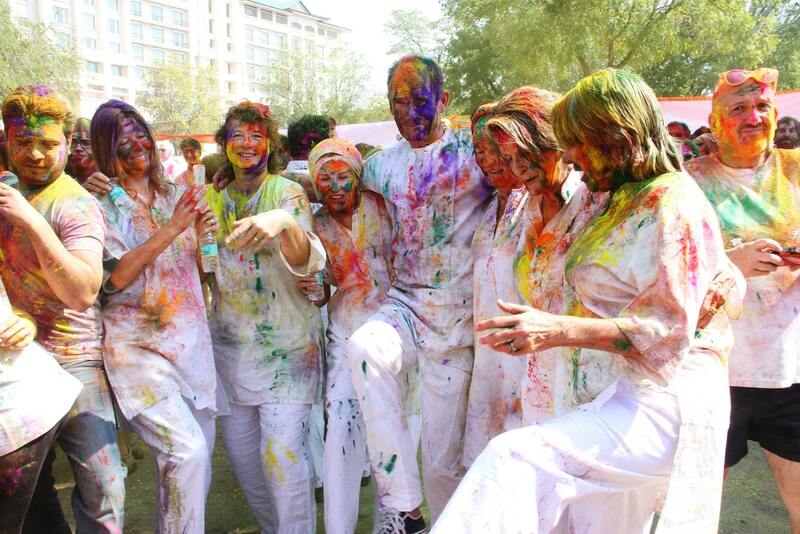 However, Jaipur also included in the list of top places to celebrate Holi in India. Rajasthan Tourism organizes a special event on the day of Holi in the Khasa Kothi hotel lawns. This event showcases and mesmerizes the tourists with its folk music besides splash of colors. Jaipur was once known for a unique experience of Holi with Elephant procession. These elephants were dolled up and adorned with ornaments. These elephants would parade as if they are walking on the ramp. Their beauty and display of folk music and other specialties would make the tourists smitten. However, it had to be called off because Animal Activism was against the use of animals, especially against the use of colors on these elephants. If you are around Rajasthan during Holi, you can still enjoy and get drenched in folk music. How to Reach Jaipur: Jaipur is well connected with various routes possible. Travelers can choose to reach using public transport besides private transport. When we talk about Shantiniketan, our mind quickly visualizes the great Indian Nobel laureate Rabindranath Tagore Ji. Yes, he was spellbound by the Holi festivities which denotes the onset of Spring. So, he unveiled this festival in the name of Basant Utsav. During Basant Utsav, students and alumni of Shanti Niketan get indulged in the resplendent play of colors. If you’re around West Bengal at the time of Holi festivities, Shanti Niketan is the place to experience blissful Basant Utsav. How to reach Shantiniketan: A small town near Bolpur in Birbhum district of West Bengal, State of India. Shantiniketan can be reached by buses, flights, and taxis. But the most convenient way to reach Shanti Niketan is by train. The Bolpur railway station is the nearest, around 2 miles away. Visiting Udaipur for the celebration of Holi gives a tremendous impression of the royalty of Mewar. 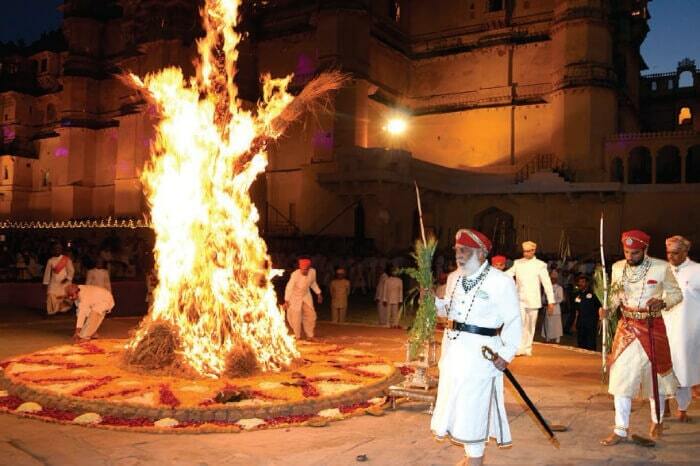 A night before the celebration of Holi in Udaipur, The Maharaja of Mewar, wholeheartedly welcomes all the honorable dignitaries, guests and foreign tourists at the City Palace for the bonfire. With the spirit of festivity, the Maharaja attends the function in full traditional attire. The royal bands and bedecked horses display their performances followed by the rituals of a Holika by the current curator of Mewar dynasty. The following forenoon, the festivity of Holi is set out on the lanes of Udaipur. How to reach Udaipur: Udaipur, a royal city of Rajasthan, India has its Airport in the name of Maharana Pratap Airport, which is at a distance of 14.9 miles from Mewar Palace. Besides Airways, travelers can prefer to get through by roadways and railways from any part of India. The best example of expecting the unexpected is the celebration of Holi in Hampi, a place in Southern India. Holi is royally celebrated in North India, but Hampi precedes as an extraordinary Southern village to rejoice Holi. This festivity continues for two-days, and people gather on the streets to dabble colors. The tourists, as well as the regional people, enjoy this festival of color by dancing on the beats followed by a pleasant dive in the river. How to reach Hampi: India’s proud heritage city, located in the Karnataka State of India. Air: Belgaum airport is the nearest Airport to Hampi. However, is 168 miles away. Train: Railways don’t have any primary link to Hampi so, the nearest station to reach Hampi is 8 miles away from Hospet Junction. By road: Hampi has well-linked roadways that connect it to Bangalore and many major spots in Karnataka. Mumbai is a Holi festival location which is famous due to Bollywood Holi celebration and parties and it has thousands of reasons that will you to celebrate you this Holi in Mumbai. Mumbai has its own ways to celebrate the Holi festival. 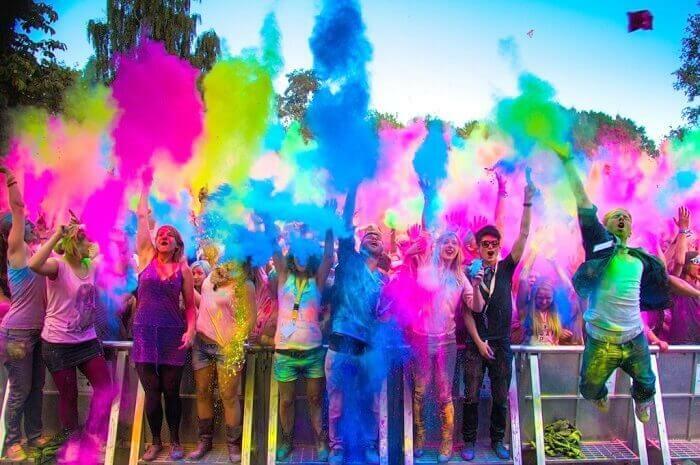 From Holi parties to camping events, Holi in Mumbai is going to take another level during this year. 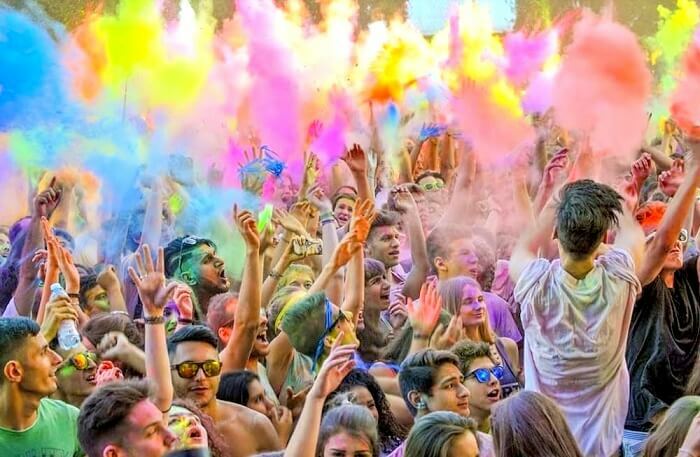 If you are wondering where is Holi celebrated with dance, music, and party then Holi in Goa is the best possible option for you. Holi festival in Goa is also known as Shigmp Holi and it is celebrated with their all religious traditions. 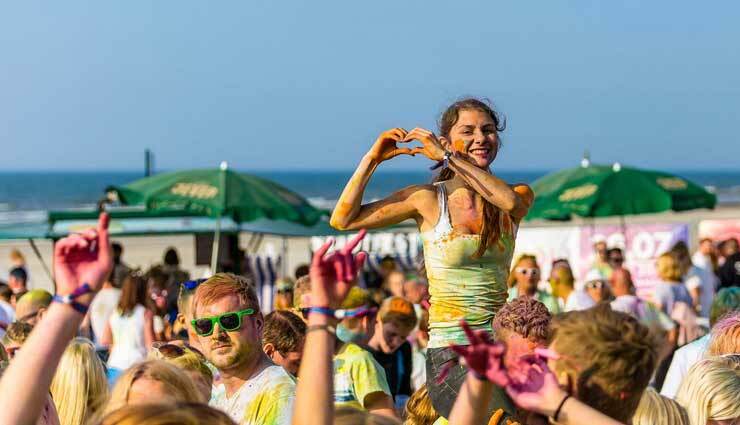 There are some special arrangements too for the grand celebration of Holi in Goa where usually people play with colors and dance on the loud music. Holi rain dance party is the main point of attraction in Goa which attracts tourists to celebrate Holi in Goa style. Delhi is also one of the best places to celebrate Holi in India. The best part during Holi festival in Delhi is its loud music and ebullient ambiance. Even if you aren’t in the mood of playing with colors, the peoples of Delhi and its loud music will surely make you dance and celebrating with colors in the party. Holi is not just a delightful experience at the abovementioned places, but also at least once in a lifetime experience if you are not a local of these places. Do not forget to capture these moments in your camera and etch them in your beautiful memories. So, what are you waiting for? Book your tickets for Holi in 2019. Just fly high in the flamboyant sky. We urge you to approach Lih.travel to thoroughly plan, organize and manage your Holi celebrations for bookings, travel, accommodation, experiences and much more! Partake in this year’s Holi season to soak in this lush, the festival of colors is an embodiment of the rich Indian culture. Lih.travel will ensure you take a mind full of vivid memories home!